Do your clients and patients remember when fat was considered bad in the 1980s? Fortunately, the once-common recommendation to eat nothing but low-fat foods and fat-free snacks has fallen away. Today, nutrition professionals are telling their clients to eat more foods with heart-healthy fats, such as nuts and olives. When Carol Plotkin, MS, RD, CDN, ACSM, a health and fitness specialist who owns On Nutrition in Rochester, New York, works with clients who want to steer clear of fat, she shows them the benefits of eating fats in moderation. “They’re happy to learn that fats help us absorb some nutrients and that they increase satiety. They’re almost surprised and relieved that some fats are protective of the heart,” she says. In recent years, scientists and health care professionals have developed a clearer understanding that the types of fat, rather than the amount consumed, can positively affect cardiovascular disease risk.1 High saturated fat intake is associated with higher levels of both total cholesterol and LDL cholesterol, both of which are risk factors for cardiovascular disease (CVD). Research also links trans fats to an increased risk of CVD.2 On the other hand, unsaturated fats, both monounsaturated and polyunsaturated, have cardioprotective effects. On average, saturated fat contributes 11% of total calories to the diet, which is higher than the 7% to 10% that’s recommended.2 “The current recommendations are to replace saturated fatty acids with unsaturated fat,” says Penny Kris-Etherton, PhD, RD, a distinguished professor of nutrition at Penn State University. Monounsaturated fatty acids, also known as omega-9 fatty acids, do a great deal to protect the heart, says Leah Gillingham, PhD, of the Richardson Centre for Functional Foods and Nutraceuticals at the University of Manitoba in Canada. 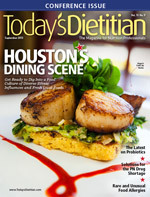 A 2011 review published in Annals of Nutrition and Metabolism shows that monounsaturated fatty acids are associated with a slight yet significant effect on both systolic and diastolic blood pressure compared with a diet low in monounsaturated fatty acids.3 They also appear to improve insulin sensitivity when they replace either saturated fatty acids or carbohydrate in the diets of both healthy and insulin-resistant individuals, Gillingham says. The effects of monounsaturated fatty acids on lipids vary (see table below). When monounsaturated fatty acids replace saturated fatty acids, LDL and total cholesterol drop by 6% to 10%. There’s no effect on HDL cholesterol, although monounsaturated fatty acids favorably reduce the total cholesterol to HDL cholesterol ratio. Both HDL and triglyceride levels improve, however, when monounsaturated fatty acids replace carbohydrate. Polyunsaturated fatty acids include both omega-3 and omega-6 fatty acids. “Polyunsaturated fats decrease LDL and total cholesterol 8% to 12% when compared with saturated fatty acids,” Gillingham says. Consuming EPA and DHA, the long-chain omega-3 fatty acids found in cold-water fish, can improve blood triglyceride and HDL cholesterol levels, she says. Alpha-linolenic acid (ALA), the short-chain omega-3 fatty acid found in some plants, as well as the two long-chain omega-3 fatty acids have beneficial effects on blood pressure and insulin sensitivity, she says. The AHA recommends eating oily fish at least twice per week to obtain EPA and DHA and to regularly consume oils, walnuts, and other foods rich in ALA.5 Unfortunately, Americans consume, on average, one fish meal every 10 days, and it includes fish sticks and fried fish, which typically are low in omega-3 fats. Omega-3 fatty acids comprise only about 10% of total polyunsaturated fat intake. The majority of omega-3 intake comes from plant-sourced ALA, but Americans need more from EPA and DHA, Gillingham says. Research shows that omega-6 fatty acids also may be cardioprotective. Some consumers and health professionals have expressed concern about consuming too much omega-6 fatty acids for fear of disrupting the omega-6 to omega-3 ratio, but many experts now say not to worry. Though it was once believed that omega-6 fatty acids increased arachidonic acid, the precursor to inflammatory compounds, researchers have found this isn’t true, Kris-Etherton says. Omega-6 fatty acids slightly lower HDL cholesterol, Gillingham says. However, the substantial improvement in total and LDL cholesterol more than offsets this effect, resulting in a favorable reduction in the total cholesterol to HDL cholesterol ratio compared with saturated fatty acids, Gillingham says. Regardless of the statements made by the AHA, the FAO, and WHO, many people still question these findings and believe that omega-6 fatty acids should be reduced because they compete with omega-3 fatty acids for the same enzymes, leading to the development of either proinflammatory or anti-inflammatory compounds. “A recent reanalysis of the Sydney Diet Heart Study revealed that intakes of omega-6 fatty acids at 15% of energy resulted in an increase in the rates of death from all causes, coronary heart disease, and cardiovascular disease among men with a recent coronary event,” Gillingham explains. Since current American intakes of omega-6 fatty acids are 7% of calories and within dietary guidelines, the focus should be on increasing omega-3 fatty acids, especially EPA and DHA, which would inevitably result in a decrease in the omega-6 to omega-3 ratio, she adds. • Eat fatty fish at least twice weekly. • Snack on a handful of nuts instead of sweets. • Add texture and creaminess to a sandwich with avocado. • When baking, replace 1/4 cup of butter with 3 T of olive or canola oil. • Substitute all or one-half of the butter in your recipe with canola oil. • Check ingredient lists for canola, sunflower, soybean, or olive oils. Choose these over partially hydrogenated oils. Plotkin frequently describes healthful eating by showing her patients the Mediterranean Diet Pyramid, which includes healthful fats in the form of olive oil, nuts, and fatty fish. Emphasizing that portion sizes are important, she shows her patients prepackaged nuts to demonstrate a proper amount. Moreover, she encourages them to sauté their food in small amounts of cooking oil and add additional moisture, if necessary, with broth. — Jill Weisenberger, MS, RD, CDE, is a freelance writer and a nutrition and diabetes consultant to the food industry, including Omega-9 Oils and Good Fats 101. She has a private practice in Newport News, Virginia, and is the author of Diabetes Weight Loss — Week by Week. American Heart Association Fats 101 has a simple Q & A section that includes responses to questions such as “Can fats be part of a healthy diet?” The site makes it easy to learn more about the Fats Family, the various types of fats depicted as Bad Fats Brothers and the Better Fats Sisters. Visit www.heart.org/HEARTORG/GettingHealthy/FatsAndOils/Fats101/Fats-101_UCM_304494_Article.jsp. Good Fats 101 (www.goodfats101.com) is an unbranded website powered by Dow AgroSciences Omega-9 Oils. It features recipes and various tools, including a shopping list, label-reading guide, fact sheets, and a chart identifying the sources and properties of omega-3, -6, and -9 fatty acids. Oldways (http://oldwayspt.org) is a nonprofit food and nutrition education organization. You’ll find downloadable handouts, including the Mediterranean Diet Pyramid, “12 Great Ways to Use Avocados,” “12 Great Ways to Use Peanuts and Peanut Butter,” and more. In addition, the site provides heart-healthy Mediterranean-style recipes. 1. US Department of Agriculture, US Department of Health and Human Services. Dietary Guidelines for Americans, 2010. 7th ed. Washington, DC: US Government Printing Office; 2010:24. 2. US Department of Agriculture, US Department of Health and Human Services. Dietary Guidelines for Americans, 2010. 7th ed. Washington, DC: US Government Printing Office; 2010:25. 3. Schwingshackl L, Strasser B, Hoffmann G. Effects of monounsaturated fatty acids on cardiovascular risk factors: a systematic review and meta-analysis. Ann Nutr Metab. 2011;59(2-4):176-186. 4. Liu X. Effects of canola oil and high oleic canola oil-rich diets on abdominal fat mass in individuals at risk for metabolic syndrome. Paper presented at: American Heart Association’s EPI/NPAM 2013 Scientific Sessions; March 21, 2013; New Orleans, LA. 5. Kris-Etherton PM, Harris WS, Appel LJ. Fish consumption, fish oil, omega-3 fatty acids, and cardiovascular disease. Circulation. 2002;106(21):2747-2757. 6. Harris WS, Mozaffarian D, Rimm E. Omega-6 fatty acids and risk for cardiovascular disease: a science advisory from the American Heart Association nutrition subcommittee of the Council of Nutrition, Physical Activity, and Metabolism; Council on Cardiovascular Nursing; and Council on Epidemiology and Prevention. Circulation. 2009;119:902-907. 7. Moshfegh A, Goldman J, Cleveland L. What We Eat in America: NHANES 2001–2002: Usual Nutrient Intakes From Food Compared to Dietary Reference Intakes. Beltsville, MD: US Department of Agriculture, Agricultural Research Service; 2005. 8. Food and Agriculture Organization of the United Nations. Fats and Fatty Acids in Human Nutrition: Report of an Expert Consultation: 2010. Geneva, France: Food and Agriculture Organization of the United Nations; 2010. 9. International Food Information Council Foundation. 2013 Food & Health Survey: Consumer Attitudes Toward Food Safety, Nutrition & Health. Washington, DC: International Food Information Council Foundation; 2013.